Suzuki Corporation is the world's largest producer of musical instruments for education, and a most respected name in music education. Thomas Music Instruments Co. Pvt. Ltd. is privileged to present to India this selection of Suzuki musical instruments for education as well as recreation. 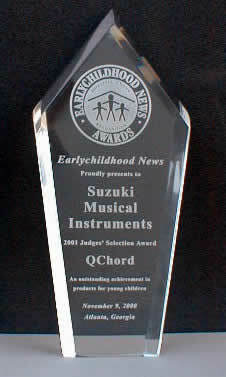 Suzuki's QChord Digital SongCard Guitar received recognition as an outstanding educational product for children with two awards at the international conference of the NAEYC (National Association for the Education of Young Children). The 12th annual Early Childhood News Awards honored the QChord with both a Directors' Choice Award, and a special Judges' Selection Award. With an attendance of over 20,000, the NAEYC conference represents the largest annual gathering of child care providers. "We have created the 'Judges' Selection' to single out unusual or outstanding products. We want to continue to recognize many excellent products with Directors' Choice Awards, but we also wanted our judges to be able to identify a smaller group of products for special attention". "We are most pleased that Early Childhood News' distinguished panel of judges has found the QChord worthy of these honors. It confirms our experience over the years with the many educators and musical therapists who have found the QChord (and its predecessor, the OmniChord) uniquely suitable for their work." "There is simply no other musical instrument available that offers such instant and wide-ranging access to the world of musical performance and creativity. QChord's advanced digital technology eliminates the "clinker" stage that discourages so many from achieving sufficient mastery of other instruments to experience the educational and therapeutic benefits of musicianship. The QChord enables almost anyone, regardless of their age or physical limitations, to immediately express themselves musically - and sound professional doing it. At the same time, its many advanced features can accommodate whatever level of musical knowledge and proficiency to which the user may aspire." 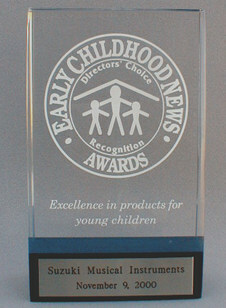 For more information on Early Childhood News, visit www.earlychildhood.com. National Association for the Education of Young Children. "Singing as a Teaching Tool".